Estee Lauder’s Autumn 2011 collection goes by the name Modern Mercury and includes three limited edition Pure Color Liquid Eyeliners in a trio of metallic shades. I’ve got one of the three shades here to show you: Graphite. A sparkling charcoal with multi-coloured shimmer that makes such a lovely change from black. I’m already a big fan of charcoal eyeliner, it provides a softer look that still carries a bit of impact. Infact, I’m wearing my Lord & Berry in this post on another item from the Modern Mercury collection! 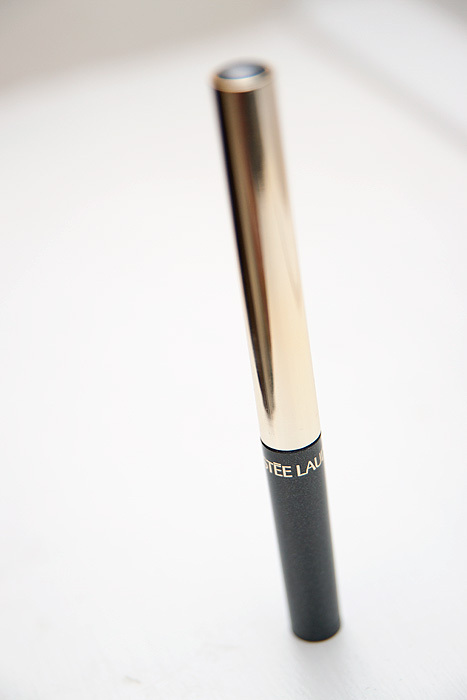 Long-handled, slender and well-designed with a flexible, soft nib for drawing precision lines, the Graphite liquid liner ticks most of the boxes. I prefer this design to spindly brushes or chunky nibs as I find they offer the greatest compromise between control and precision. The inky formula is well pigmented and opaque within two strokes. It dries very quickly to a smudge-proof, water-proof finish providing a metallic gleam that manages to avoid the ‘wet-look’. It’s all great so far huh? Except, there is one problem… it flakes. You’ll get to around 90% satisfaction before this bothers you but really? It shouldn’t flake at all and it’s a bugbear for me. It won’t stop me wearing it but it will stop me wearing it with complete confidence. The above photo was taken about 5 hours into my day and you can see that it’s holding up pretty well but there is evidence of some flaking going on… a few specks around my eyes and a little caught in my eyelashes. You can’t see in the above photo but the top edge of the line is no longer perfect, this is the first area to show signs of wear. I’m being pernickity (as always) but when I’m reviewing an eyeliner that costs £19.00 – it’s only right that I am. Most of these are now discontinued but luckily, the one that bears the closest resemblance isn’t! Again, it’s Barry M that’s coming up to be the nearest in terms of shade duping so if you’re on a budget, check it out! 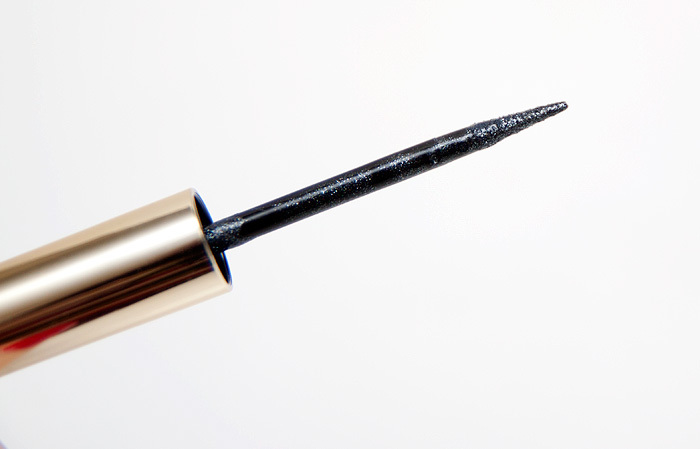 Estee Lauder Pure Color Liquid Eyeliner in Graphite (£19.00) is available on counter now and online at Estee Lauder. 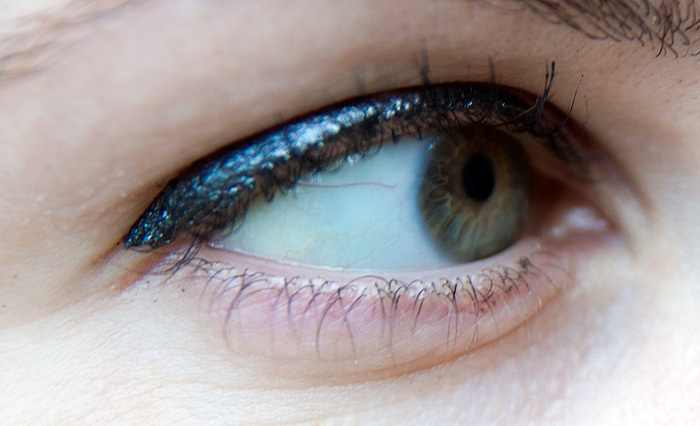 Do you wear grey eyeliner? What’s your favourite? I JUST got the Graphite eyeliner! It looks fab on you! Ohh i love!! Must check this out! 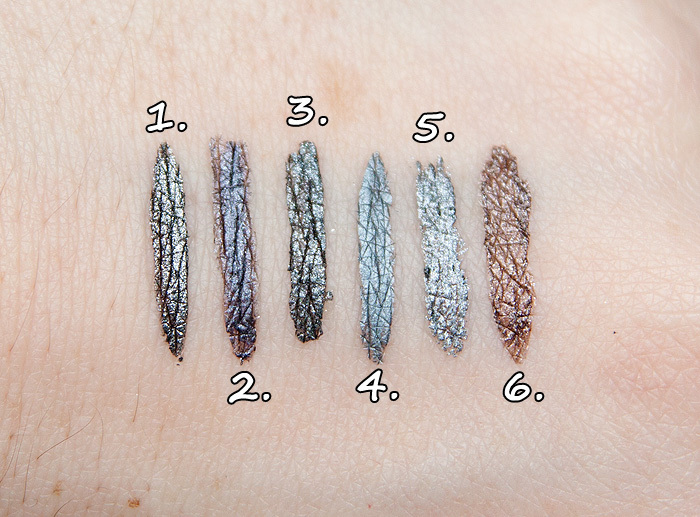 The Barry M shade looks more pigmented and ‘drama’ to me – so even if I could afford the £19 for EL, I’d probably skip it for the Barry M anyway haha I don’t wear grey ‘liners often, but sometimes mix Illamasqua sealing gel with dark, glittery shades for a metallic look. I have pale skin and blue grey eyes so have always used grey eyeliners in preference to any other colour. A ggod one for me in terms of colour is Rimmel hurricane but lately have fallen head over heels for Bobbi Brown longwear gel eyeliners. My day and evening one is granite ink – just a touch softer than black although still lots of depth of colour. I also love graphite shimmer ink which is lighter in colour and just a hint of shimmer – good for day or night. The color is so beautiful and a great alternative to black for everyday looks. Too bad it flakes though. The color is beautiful! It’s a shame it flakes off I think I might still check it out, though, just for that color. Check out the Stila waterproof eyeliners, they are beautiful, don’t budge and they have a colour similar to this I think love this colour too, subtle but you are still standing out from the crowd a little. Beautiful photos in this post and I love the new look of your blog. I can’t handle flaking in a liner, which is a shame because this colour is gorgeous. You’d think that a company like Estee Lauder would manage to iron out that type of flaw.